The ruins of St Mary’s Church lie a short distance to the west of Tintern Abbey on Chapel Hill. The ruins of St Mary’s Church can easily be reached on foot from Tintern Abbey (approximately 20 minutes). Just walk up to the A466, cross the road and proceed up the lane where the post box is located in a wall until you reach a footpath beside a bungalow. Take the footpath and after a steep but short stroll you will reach the ruins from which you can enjoy spectacular views of Tintern Village and the River Wye. You can return either on the same route or you can bear to the left on your descent at a fork in the path and this will take you down Chapel Lane to the Abbey Mill and the village beyond. 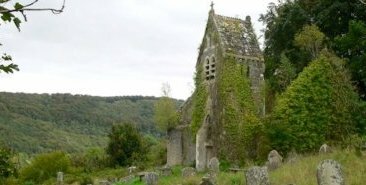 The church, which was rebuilt in 1866, stands on the site of a medieval chapel, probably built as a retreat for the monks of Tintern Abbey or for the secular community growing outside the Abbey walls. Parish records date back to 1695 and reflect the more populous and hectic days of the nearby Angiddy Valley’s industrial period.The earliest monumental inscription is in memory of Francis Bradford, dated 1657, who founded the Bradford Charity. St Mary’s Church was at various times associated with the parishes of Llandogo, Trellech, and Llanishen as well as Tintern Parva, being finally annexed to the latter in 1902. 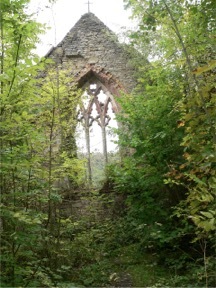 The church became redundant in 1972 and some of the contents were sold to Clearwell Castle. The communion plate, altar cross, processional cross and candlesticks are to be found in St Michael’s church, at the other end of the village. St Mary’s was destroyed by fire in 1977. The graveyard contains several interesting monuments including one to Peter Carr who died on the 14th of October 1913 in the Senghenydd Pit disaster and a war grave To Private B B Hall, an American citizen who enlisted in the Lancashire Fusiliers and who died at Connaught Hospital, Farnborough on 5th March 1919 aged 22 years. The graveyard is still in use to this day. Work on restoring a listed sarcophagus tomb in St Mary’s churchyard to its former glory has now been completed. The tomb has been painstakingly recovered in pieces from the surrounding plot and restored with traditional methods because of its age and listed status. The tomb was originally believed to be that of Robert Thompson (1757-1821) who married into the Crawshay dynasty, in Merthyr Tydfil in 1790 and his wife Elizabeth who was the sister of Richard Crawshay. 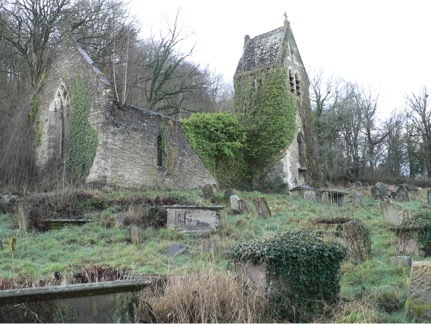 Elizabeth and Robert, who was also High Sheriff of Monmouthshire in 1817 and held the lease for the Tintern wireworks, were both buried at St Mary’s Churchyard. However, after extensive research and an examination of the eroded inscription on the cast plates the tomb is believed to belong to Richard White, a wealthy ironworks leaseholder who died in 1765. The project received support from Tintern Community Council and the Village Alive Trust as part of the Rural Development Plan for Wales (2007-13). Funding was provided by the Welsh Government and the Agricultural Fund for Rural Development and has also received funding through the sustainable development fund in the Wye Valley Area of Outstanding Natural Beauty (AONB) and the Leche Trust. The work was carried out by Mark Hancock, of Centreline Stone, in Painswick. The tomb is special because it is one of the earliest monuments to be listed and protected. 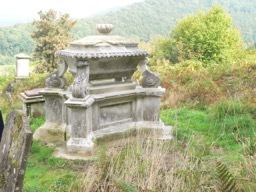 A council spokeswoman said: “We wanted to get this rather lovely old tomb restored, especially as the person buried there had local connections with the ironworks and was obviously well-thought of”. St Mary’s church is privately owned. The graveyard is still owned by The Church in Wales.